080.David Morneau – JavaMuseum 2010 – Celebrate! does not compose his music with a ‘poetic power’ that emphatically discharges from his work enchanting you in a hallucinogenic state of borderline exaltation. 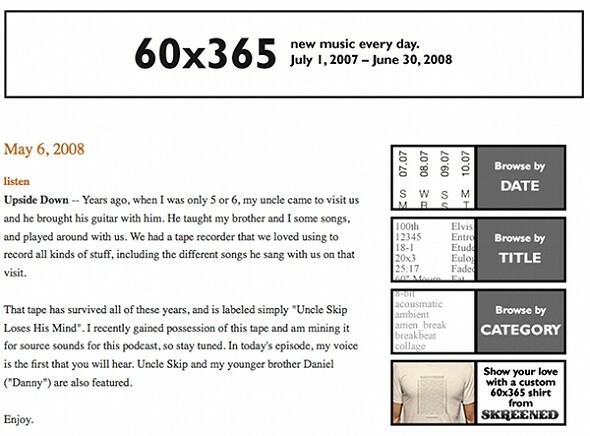 60×365 (sixty by three-sixty-five) is a new music podcast examining the potential of the internet as an environment for the creation and dissemination of new music. Every day for a year, I composed a new sixty-second composition and posted it online at http://60×365.com. This project was live from July 1, 2007 to June 30, 2008, resulting just over six hours of new music. By and large these pieces are not serial or sequential in nature. Each piece stands alone as a complete entity. There are some sets of pieces exploring a common idea, or sharing source material, that can grouped into a small series of pieces within the whole collection. These are still separate pieces though. Each daily post brought something new and different, a constant variety. The daily nature of 60×365 allowed me to explore many different music styles and techniques, including musique concrète, sine wave synthesis, digital sampling, 8-bit constructions, process music, acousmatic composition, and post-techno beat manipulations. Choices about how to proceed each day were often affected by other events in my life, by my comfort level with a particular process (unfamiliar techniques required more time to execute), and by my interests at that moment. 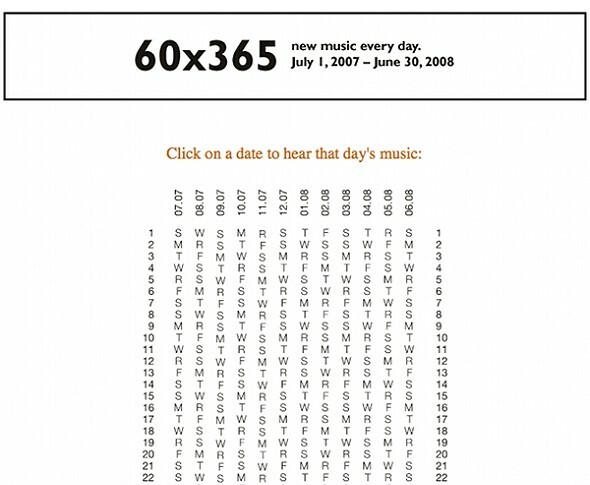 In this way, 60×365 has a diary-like element in it (many blogs do).